I loved the pie lady. We never knew her real name. Maybe my mom knows. Moms know that sort of thing. She lived two miles out of town. Calculating miles in the country is easy, each stretch of road between crossroads, is almost always one mile. So the one stop light in town to The Pie Ladies house was and still is 2 miles. Her house sits across the road from the Pig House ( it was once painted pink and the front windows and porch made the house look like an oinker…ha!) The pie lady no longer sells pie from her home. But we still refer to the house as the ‘Pie Ladies’. I wonder if she even still lives there. There was a simple hand made sign that leaned up against a tree in their front yard when there were pies. The sign was a beacon to fellow pie lovers. A candle in window, or was it two candles in the window? It was candles, right? When it was leaning, we stopped. Almost always. Sometimes we made the two mile trek to see if the sign was out. And then we stopped. By the time I was 12, I knew the power of pie. I also knew that I LOVED pie. 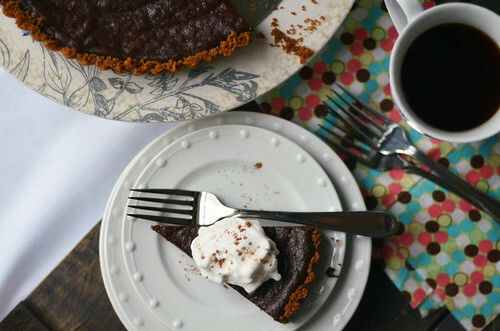 She had all the flavors ….fruit and cream pies to feed the masses and please the tastebuds. While secretly I wanted the deep dish blueberry or the apple…we always got a banana, coconut, or chocolate cream pie. Favorites of my father…he had the final word, which was fine, because who is really going to complain about his choices? Only a crazy person and his 12 year old daughter…I really wanted the blueberry! But I dealt. And I ate banana, coconut, and chocolate cream pies. And I disliked the chocolate one the most. 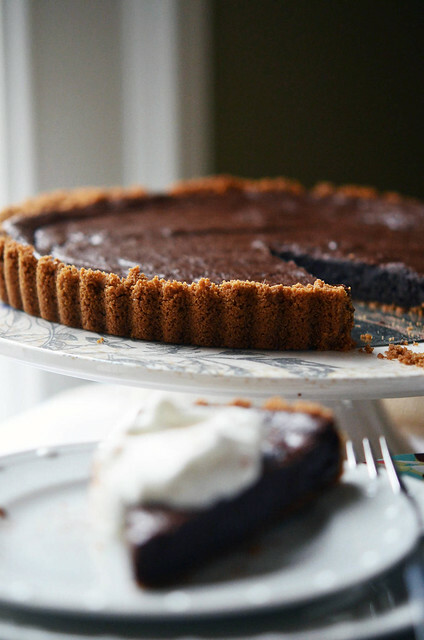 Her chocolate cream pie was super-duper chocolate. Homemade dark chocolate pudding was just too much for my young tastebuds. Tastebuds that were only sophisticated enough for creamy milk chocolate from a man named Hershey. Or pudding from a box and every once in a great while…pudding from those plastic containers that strangely didn’t need refrigerated and was found in the cool kids packed lunches or your lunches on field trip day, right next to the pop wrapped in tinfoil. This was the pudding I was accustomed to. And now, as an adult, I wish I had all those pies back. Kids are so stupid. A few notes on the pie itself. Use quality bittersweet chocolate. This is not the time to use chocolate chips. Trust me. Spend good money for good chocolate. You will be thankful that you did. 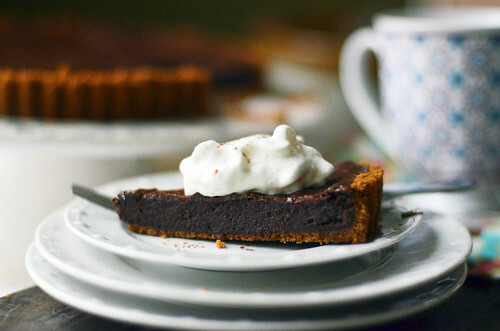 And the ginger snap crust, use it. Do not substitute with vanilla wafers or graham crackers (unless you can’t find ginger snaps, then I would totally understand) But otherwise, trust me. 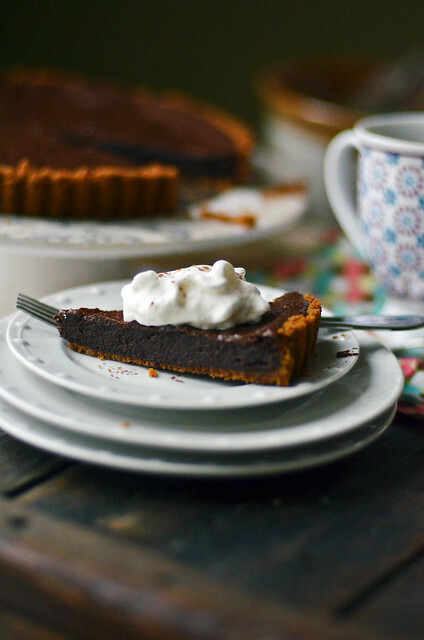 I was a little leery of ginger in combination with chocolate ( I don’t like my chocolate flavored beyond chocolate), but the crust only adds a light gingery undertone, one that is pleasant and wonderful against the rich chocolate. Oh! 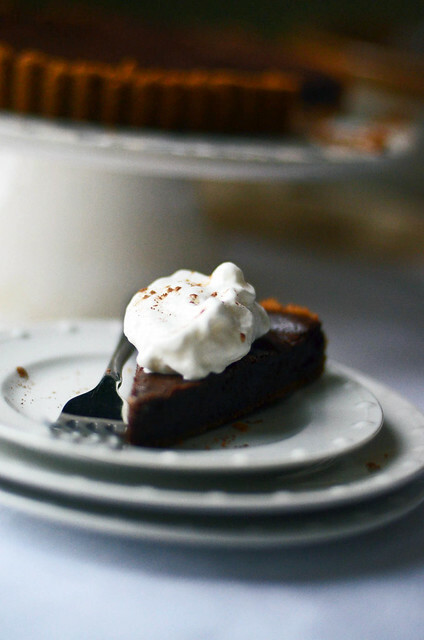 I recommend topping this pie with freshly whipped cream that is slightly sweetened. Boy, do I love pie. You will need a 9 inch tart pan with a removable bottom. Finely grind gingersnaps in a food processor. Add melted butter and salt, and pulse until crumbs are moistened. Firmly press crust into the bottom and up the sides of a 9 inch round tart pan with a removable bottom. 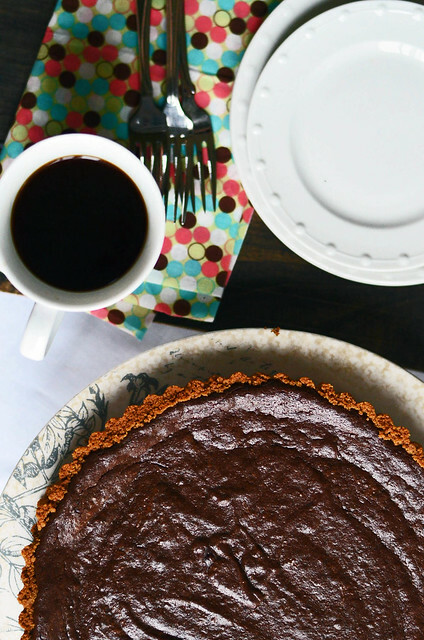 Place on a rimmed baking sheet, set aside. Combine chopped chocolate and heavy cream in a medium sized saucepan and place over low heat. Whisk until chocolate melts and the mixture is smooth. Remove from heat. In a medium mixing bowl, whisk together egg yolks, egg, sugar, flour, pepper, cinnamon, and a pinch of salt. Slowly, so not to cook the eggs, whisk the chocolate mixture into the egg mixture, and whisk until smooth. Remove from oven and place on wire rack and let cool. « Baked Risotto with Roasted Vegetables.